↑ 1421 تکّ اگلیری راجدھانی؛ پھیر مڈھلی راجدھانی. 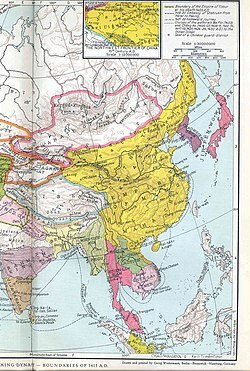 ↑ The capitals-in-exile of the Southern Ming were Nanjing (1644), فوزو (1645–6), گوانگزو (1646–7), زاؤچھن (1646–52). ↑ Turchin, Peter; Adams, Jonathan M.; Hall, Thomas D (December 2006). "East-West Orientation of Historical Empires". Journal of world-systems research 12 (2): 219–229. ISSN 1076-156X. http://jwsr.ucr.edu/archive/vol12/number2/pdf/jwsr-v12n2-tah.pdf. Retrieved on 12 اگست 2010.